Thank you for joining me for the very first episode of Feminist Wellness. I am excited to be here and excited to help you take back your health; not just to Band-Aid your symptoms, but to get at the root causes. The good news is I’ve been where you are and I know that transformative life healing change is possible… yes, my love, even for you. Our minds, bodies, and spirits are inextricably linked and none of us can achieve our best health, wellness, or purpose in this world without all three being balanced. I know this to be true. And my purpose on this earth, and with this podcast, is to help you reclaim your power and restore your health by offering myself as your guide on this journey. Maybe you’ve been to a whole bunch of doctors and specialists who either gave you a string of diagnoses that never got resolved, or maybe told you they couldn’t find anything wrong with you. Or maybe you’re just feeling stuck. You’re not sure who to trust and how to get the information you need. You feel stuck in frustration, resentment, powerlessness. If any of this resonated for you, keep listening; help is on the way. A little bit about me and why my approach to wellness is different than you might be used to. The two things I did that changed my life dramatically. The tenets of living a healthful life that I will be sharing with you on this podcast. How the socialization of women affects our health. 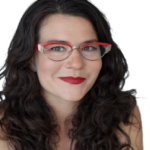 How actualizing a feminist belief that I hold dear can affect your health. That I am equal parts science nerd and intuitive healer and why that matters. The secret to your health. Are you ready to reclaim your power and restore your health, starting today? Download my FREE ebook here! You’re ready to feel better, starting now. And I know that that’s possible with the right tools and the right guide. Maybe you’ve gone to a dozen doctors and therapists and you still haven’t gotten to the root cause of what’s keeping you feeling less than amazing. You’re done with just talking about your digestive symptoms, your fatigue, depression, anxiety, and not feeling heard. You’re ready to make real change for your mental and physical health, starting now. You want to learn how to stop rolling around in resentment, frustration, anger, or fear. You want to figure out your life’s purpose, to set goals, and get things done. You want the psychology, the science, a touch of magic, and a lot of practical, actionable, easy tools you can use starting now to help you get unstuck. If this sounds like you, my love, keep listening. You’re in the right place. Hello, hello, my kittens. Welcome to episode one. I am so excited to be here with you. I’m coming to you from a fifth-floor walkup in Brooklyn, New York City. I’m sitting in front of an open window on a strangely and delightfully warm winter day here. I’m going to the infrared sauna with two dear friends tonight and I’m so excited. I’m from Argentina originally, and even though I grew up in Rhode Island, the greatest state on earth, where it gets rather cold in the winter, the cold these days just seems to seep into my bones and it feels really hard to shake it off. Saunas help. Time with good friends helps. It also feels like New Yorkers go into this deep hibernation mode in the winter, and it feels so important to reach out and connect. It can get wicked lonely if you don’t. But you didn’t come here to hear about the trials and tribulations of winter living in the Northeast, did you? My name is Victoria Albina and I’m a witchy-woo-loving science nerd. I have a master’s degree in public health. I’m trained as a family nurse practitioner, a western herbalist, and a cognitive behavioral life coach. And, probably most importantly, I’m a healer who believes in the transformative ability of all of us, yes, even you, to heal ourselves. My approach is probably different than the approach of most folks you’ve worked with. I like to mix healthy doses of science, psychology, medicine, and a little bit of magic, to help folks live their best lives on their own terms. I know that our minds, bodies, and spirits are inextricably linked and that none of us can achieve our best health, wellness, or purpose in this world without all three being balanced. If you’re listening to this show, I hope it’s because you’re ready to make some changes in your life. You’re ready to feel more confident, more powerful, more clear and capable in your path. You’re ready to take back your health too; not just to Band-Aid your symptoms, but to get at the root causes. The good news is, I’ve been where you are and I know that transformative life healing change is possible. I come to this work because I was sick my whole life. In my 20s, after years of living with chronic belly pain, indigestion, gas, bloating, depression and anxiety, I got sick of being sick and took my health, both physical and mental, into my own hands. I started my herbalist counseling and holistic western medical training all with a goal of finding the root cause of my own endless digestive troubles, fatigue, and mental health blahs. In the 20 years since starting my healing journey, I’ve helped thousands of people, especially women who’ve suffered from the same emotional and physical stagnation that I’ve felt. I’ve reclaimed and restored my physical and mental health and I’m really proud to say that I’m thriving now more than ever. My life changed dramatically when I did two things. First, I learned to reclaim my power both emotionally and spiritually. I learned to trust myself, my power, my body, all tools that helped me that I want to teach you. And second, I restored my health by getting to the deep causes of what was ailing me and uncovering the connection between mind and body. I know that my life’s purpose, and the purpose of this podcast, is to help you do these same things. Here’s what I’ve learned that I’m really excited to share with you. One, there is no physical health without emotional spiritual health and vice versa. While Western medical tradition has historically taught us that these things, mind and body, can be treated in isolation, there is a vast and ever-growing body of evidence-based research reflecting what so many of us have known for so long; mind and body are deeply linked. Tending to one must mean tending to the other if we are to get to our truest health. Two, we are absolutely capable of healing our own bodies and minds. We just need the right tools and the right support to get there. I’m living proof. Our bodies are magical, mystical, amazing machines. We must fuel and tend to them properly in order to allow them to do what they’re fully capable of doing; healing us and keeping us well. Three, we cannot be healed and we cannot be well without owning and knowing our full power in the world, without loving ourselves unconditionally, even when we have hard days, and without developing the tools necessary to relate to others in our lives using healthy honest communication based in our own self-love. So many of us, especially those of us socialized as women, have been systematically disempowered and belittled our whole lives. We’ve internalized these stories of giving but not asking for more, of allowing others to treat us poorly or in ways that don’t really work for us, of taking care of the whole world first without first taking care of ourselves. In order to heal, in order to be well, we need to reclaim our power and our absolute knowledge that we are worthy, we are loved, and we are deserving of everything we desire in this one beautiful human lifetime. I’ve spent years learning and proving these lessons for myself and with my clients and patients. I’ve studied it all, Western medical system, science and the deep dark ways of looking at cells, herbal medicine, nutrition, meditation, Buddhism, psychology, life coaching. I tried everything I could to heal myself; every diet, every herb. I went to countless doctors and specialists and had every test they knew about. And time after time, I heard the last words any chronically sick person in the midst of their suffering wants to hear, which was, “All your tests came back negative. You’re fine, it’s all in your head. You should learn to relax.” I heard it all so many times. I was so frustrated and exhausted. It wasn’t until I absorbed these new lessons, until I got proper medical care from integrative providers like myself who cared about the root cause of my illness, until I learned the cognitive behavioral tools that I use every single day, until I learned the cognitive behavioral tools that help me get out of my own resentment, frustration, and feelings of powerlessness over my life that I truly healed. And it was the integration of all of these that has me feeling my absolute best as I’m coming up on 40. So, if you’re listening to this podcast, the chances are you’ve been struggling like I did. Maybe you’ve been told your fatigue, depression, digestion problems were all in your head, but when you tried therapy or went to your primary care doctor to get, “Fixed,” nothing really changed. Maybe you’ve been to a whole bunch of doctors and specialists who either gave you a string of diagnoses that never got resolved, or maybe told you they couldn’t find anything wrong with you. Or maybe you’re just feeling stuck. You’re not sure who to trust and how to get the information you need. You feel stuck in frustration, resentment, powerlessness. If any of this resonated for you, keep listening; help is on the way. Maybe you’re feeling skeptical because you’ve reached out for help so many times in the past and not gotten any better. Let me tell you a little bit about how my approach is different. First, and perhaps most importantly, I have the experience of having been the patient. I’m never going to talk down to you, dear listener. I’m here to lift you up, to teach you, to empower you. I’m also uniquely trained to address both your physical and mental health needs, and I’ll do so by helping you week by week to create a daily practice of wellness for your mind, body, and spirit. My approach is also different because I believe in root cause functional medicine. I believe that so many of the chronic illnesses we’re dealing with now are symptoms of a deeper imbalance in our bodies and are not diagnoses in and of themselves, unlike your primary care provider might have you believe. Your B-vitamin and iron levels may be off, leading to depression or fatigue and your IBS symptoms may be your body screaming out that there’s an imbalance in your gut microbiome. Each week, I’ll be talking about the common causes of our symptoms, not just how to cover things up with drugs. It’s my deep belief that there is no physical health without mental health, and no mental health without physical health. They are deeply linked. That’s why I’ll be helping you to deal with things like the daily resentments in your life, anger at your families, stories about yourself that may be keeping you feeling stuck, or the many causes of stress that can make or keep any of us feeling sick. The work I’ll be doing in this podcast is to give you concrete practical tools to manage the thoughts, feelings, and behaviors that may be contributing to your less than dreamy mental and physical health. I’ll be talking a lot about self-confidence, self-esteem, self-love, mindful communication, and healthy relationships. These things are a vital part of health. If you’re not making decisions for your wellness from a place of self-love, those changes are less likely to stick and to become true lasting change. If you believe that other people’s opinions about your food choices, your supplements, your taking the time to meditate or journal matter, then you may be swayed into eating that thing that you know upsets your digestion or makes you feel sad for days. You’re more likely to have that third drink or that cup of coffee when your heartburn is off the charts. You’re going to have a harder time getting well and staying well. How you think and feel about yourself is a cornerstone of health, so we’ll be diving deep into the psychology of wellness in episodes to come. What also makes me different is my belief in empowerment as a central tenet of health, a feminist belief I hold dear. I have long loved the Audre Lorde quote, “When I dare to be powerful, to use my strength in the service of my vision, then it becomes less and less important whether I am afraid.” I remember having this quote up in my college dorm room in the late 90s and feeling so empowered by this concept that I could take care of myself despite feeling fear. And self-care and acting in service of my vision to heal myself and others is to step truly and deeply into my power. I believe that each of us has the ability and the tools we need to heal within ourselves. We just need someone to help guide us to put all that internal brilliance into action. Our bodies are remarkably resilient and have a great capacity to heal when we can get out of our own way. I’ll show you each week how to take back control of your life and your wellness. The world can feel pretty intense and overwhelming these days and one answer, one vital remedy is to educate ourselves and to work to reclaim our health as a birthright, to focus our energy on caring for ourselves and those we love. Part of taking back my health has been educating myself deeply about the inner workings of my body and mind. The approach I’ll share with you is very nerdy and science based. I am, in fact, equal parts science nerd and intuitive healer. I spent years studying medicine, epidemiology, public health. I stay up on the latest scientific literature and will bring cutting edge research findings here for you in language that feels accessible and easy to understand and apply to your life. It’s also that training that lets me understand where Western medicine has failed us and where it’s led us to forget the ways that mind, body, and spirit are connected. The science of why your belly hurts is absolutely important, and we also need to attend to the mind and spirit to get centered and stay centered in self-love, which we’ll be doing here together. And finally, my approach is different in that I believe in the healing power of spirituality and nature. I believe that everyone needs to find their own path. I am dogmatic in no way about this. And in my work, I help people tap into the great something beyond themselves that can offer each of us hope, sustenance, power, and healing. It’s hard to go it alone and spirituality, whatever that may mean to you, can offer comfort and solace along the way, as it has for me over these last years. I understand that you are a complex human mammal with hopes and dreams and fears and limitless possibility. I have the tools you need to help you live your life to its fullest potential. I know because these tools and treatments have helped in dealing with my once daily anxiety, depression, and digestion issues. Now, I have control over these things. I know what to eat, when, and how, the supplements to take to keep my body working at its optimal, and I know how to manage my mind to choose the thoughts that will help me feel my best in any situation. All of this work, everything I’ll be sharing, is rooted deeply in some core feminist principles as I live and understand them. Trust yourself. Know and respect your body. Claim your power. Live in love and kindness. Communicate honestly and clearly. I’ll be bringing these ideals to every podcast and I’m so honored and excited that I get to do so. So, finally, my love, I want to let you in on a little secret. In fact, it’s really the secret to your health, wellness, and happiness. And that little secret is that you, my love, are worthy right now of care, affection, kindness, love, and health. You don’t actually need to change or do anything to be worthy of this and more. There may be things about yourself that you want to change, and I’m totally here to support you in making those changes. And again, the key to lasting sustainable change is to do it from a place of deep self-love and compassion, not from a place of beating yourself up because you think you aren’t worthy or perfect or good enough. I know that you are perfect and worthy and good enough just as you are, and I can show you how to sink into that belief about yourself so that you can move and grow and change and heal from a place of deep self-love, a place from which deep transformation is possible. To get you started, I want to offer you my free ebook. So head on over to victoriaalbina.com to grab a copy for yourself. Give it a read and start feeling better now. 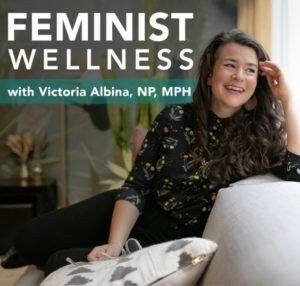 Thank you for listening to this first episode of Feminist Wellness. I’m so excited to share so much more with you in the weeks to come. Take good care of yourself and remember, when one of us heals, all of us heals. Be well. 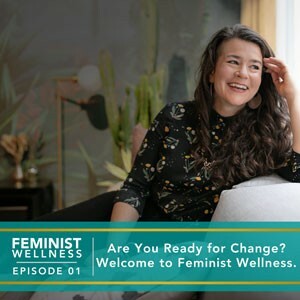 ← Announcing the Feminist Wellness Podcast! Just listened to your podcast and have to say a love your message and he content. This is the first time I’m writing to someone that I’ve listened to before, but just wanted to say thank you and that you have a new fan. Looking forward to listening some more and to maybe meet you one day. Con mucho amor y cariño!